The virtuoso musicians from Ensemble Reza are delighted to welcome talented students from Burgess Hill School for Girls to take part in their free lunchtime concert series. The show takes place on Tuesday, February 10, from 1pm to 2pm, with refreshments being served from 12.30pm at Haywards Heath Methodist Church, Perrymount Road. The programme will include popular works for a mix of string ensembles. As a registered charity Ensemble Reza are committed to supporting young talented musicians and have worked with many schools throughout the region. Ensemble Reza lunchtime concerts are supported in part with funding from Haywards Heath Town Council. Ensemble Reza also has an evening concert coming up on Saturday, February 28 (7pm). Great Cello Romantics features Franck’s Sonata in A minor and Rachmaninov’s Sonata in G minor. 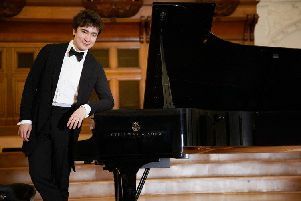 The musicians will be Pavlos Carvahlo on cello and Jakob Fichert on piano. Tickets for the show cost £13 for adults and £5 for under 18s. They are available from Pepperbox (Cuckfield), SWALK (Lindfield) and Carousel Music (Haywards Heath). Visit ensemblereza.com to find out more.